Gov. 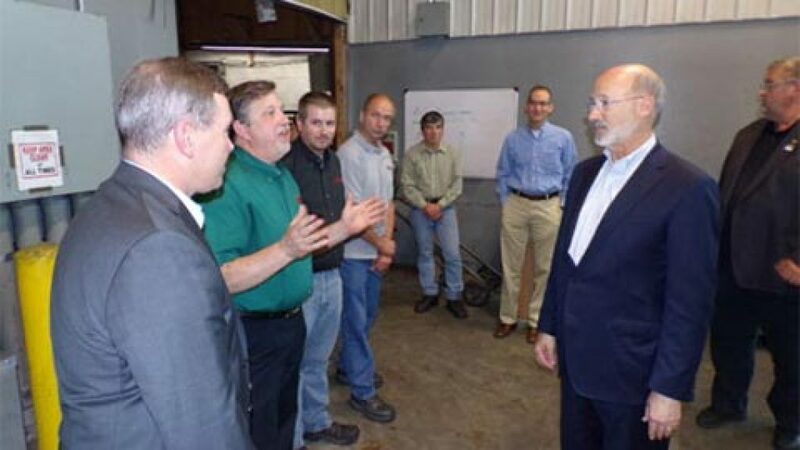 Wolf Visits Area, Tours Embassy Powdered Metals - Embassy Powdered Metals, Inc.
Last week, Governor Tom Wolf (D-PA) had a whirlwind tour of northern Pennsylvania, and visited manufacturing facilities in Emporium as part of his trip. Wolf and his wife, Pennsylvania’s First Lady Frances Wolf, made a number of stops across the region, including at Cole Memorial in Coudersport, the Zippo facility in Bradford, and the Kinzua Bridge Skywalk. Throughout the course of the four-day visit, Wolf and his entourage visited attractions, manufacturing facilities and businesses in fourteen northern Pennsylvania counties. While visiting Emporium, Wolf had a tour of the Embassy Powdered Metals facility on Airport Road, and also toured the former AST facility recently purchased by Embassy with the help of the Governor’s Action Team. Embassy Powdered Metals Acquires AST	Embassy Powdered Metals named recipient of the coveted 2018 Corporate Investment & Community Impact (CiCi) Award.